Baseball fans love to compare the players of today to the players who came before, but one must wonder how great the margin of error in these comparisons is. Is there any way of knowing who the real baseball greats are, and whose legend should stand the test of time? -holds the highest career fielding percentage of those with a long career. -has played more games at shortstop than anyone in major league history. On top of all that, Vizquel has received more Gold Gloves than any other shortstop except for Ozzie “Wizard of Oz” Smith. Indeed, writers have described Omar and Ozzie as the “graceful Fred Astaire” and “acrobatic Gene Kelly,” respectively, of shortstops. Vizquel has something of a signature play—fielding ordinary grounders (not just bunts) with his bare hand and throwing in one motion. He was the starting shortstop for the most successful American League team of the 1990s, second only to the Yankees. He hasn’t been much of a hitter, even for a shortstop, so it’s not unreasonable to infer he must have been a great fielder to hang on as long as he has. But, after all that, how do we really Vizquel actually is one of baseball’s all-time best fielding shortstops? With metrics. It is not the job of a shortstop (or any fielder) to look “graceful” or make trick plays. It’s not even a fielder’s job to avoid errors. In fact, a fielder who makes ten more successful plays but also ten more errors has just the same value as the fielder who makes an average number of plays and errors, because an error is no worse than a play not made. Any fielding metric for shortstop needs to estimate how many assists a shortstop generated above or below what an average shortstop would have, playing for the same team. My system uses some arithmetic and the statistical technique of “regression analysis,” resulting in what I call Defensive Regression Analysis, or DRA. 3. independent (approximately) of each other. 5. the relative number of runners on first base, which would impact double-play opportunities. Taking all of these factors into account, DRA finds that Vizquel has been . . . average. Actually, ‒19 defensive runs, which is just noise over the course of a two-decade career. Now he was a very fine shortstop his first three seasons (1989-91), and he seems to have had a miraculous age-40 season (2007), but he’s never been anything special in-between. DRA is not alone in estimating that Vizquel has been just average overall. Noted baseball analyst Tom Tango, who maintains one of the best baseball blogs around, has his own system for evaluating career fielding value. Tango calls his system With Or Without You (“WOWY”). As applied at shortstop, it compares the rate at which pitchers get outs at shortstop per batted ball in play with the shortstop you’re trying to rate and without the shortstop you’re trying to rate (that is, when any other shortstop is fielding behind the same pitcher). Tango’s WOWY has Vizquel just slightly above average throughout his career, probably about +17 defensive runs. Again, just noise. 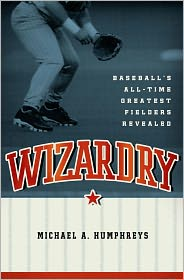 Michael A. Humphreys advises on tax aspects of international capital markets transactions at Ernst & Young LLP and is author of Wizardry: Baseball’s All-Time Greatest Fielders Revealed. Vizquel must have been playing during a weak couple of decades with the AL, to account for all the gold gloves! I bet just an average player like Omar could’nt switch to the NL and get a gold glove!!!!!! Are there a lot of “average players who can still contribute to the game at 40? Some one had better tell Vizquel that he is 44! He is not supposed to make great plays in middle infield, and hitting balls out of the park during spring training!!!!! A great long career, a great mentor for the young players, not under suspicion for drugs or gambling, I say: First ballot Hall of fame!